Celebrated jazz pianist, composer and bandleader GERALD CLAYTON will perform his new work, Piedmont Blues: A Search for Salvation at on April 14 at the Tri-C Metro Mainstage Theatre. The performance features a nine-piece band led by Clayton, vocalist René Marie, tap dancer Maurice Chestnut and Cleveland’s own Spirit of the Groove gospel choir directed by Johnny Parker. Cleveland is one of only a few selected cities to host the show. The multimedia presentation written by Clayton combines jazz, traditional buck dancing and photography. 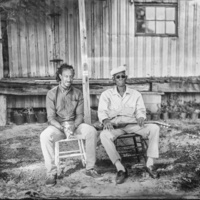 It serves as an homage to the blues and African-American culture of the tobacco-producing region of Piedmont in North Carolina. Clayton and director Chris McElroen took six research trips to Durham, North Carolina, as part of the project. During the visits, they filmed and listened to the music and stories of John Dee Holeman, Algia Mae Hinton and Drink Small. Clayton hopes the work — commissioned by Duke University — will foster an understanding of the historical context of blues and reveal the music genre’s healing power. Tickets are $30 and can be purchased at www.trictickets.com or by calling 216-987-4444. Tickets can also be bought at the door on the night of the show.